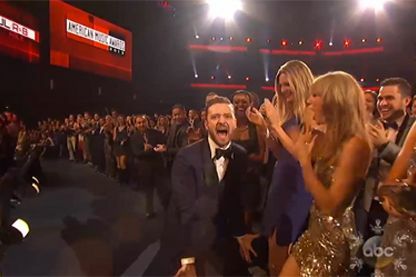 Taylor Swift is not the only one doing the Taylor Swift Face at tonight’s American Music Awards. Everyone’s feeling super surprised and super humble. Just take Justin Timberlake. Heading to the stage to accept his second AMA of the night, JT made a pit stop at Taylor Swift’s seat, so they can be excited at each other. It’s a duet!